he's sleeping 6 hours straight during the night! also, now that he's eating every 3 hours. i can finally get some much needed rest. i'm still breastfeeding. he eats about 10-15 minutes on each side. once i put him to bed, i pump. it's exciting to see all of the changes. i love to see his gummy smile. he started "hugging" his rhino. and he wiggles around on the floor, too! 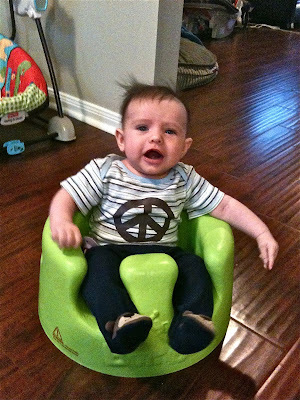 i can get things done around the house when i plop him into the bumbo. he just began sleeping in his crib. the swing helped us get through the the first couple of months. i wanted to transition him to the crib before he was dependent on the swing. 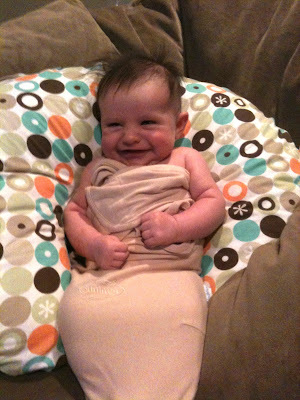 he's still enjoying the swaddling. slow down, kid!. to my disbelief, i woke up this morning to find him laying on his belly. he was waving. oh my gosh, he totally got one arm loose and flipped over. can you say, houdini! 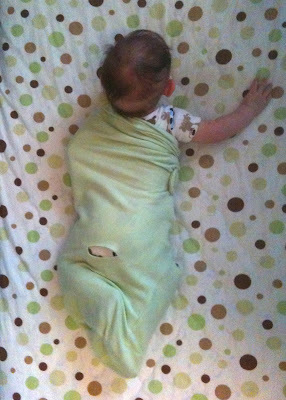 i've got wrap that little sucker a bit tighter! my baby is growing up.